Imelda Lambertini was born into a rich family, the only child of Captain General Egano Lambertini and his wife Donna Castora (her name is recorded as Castora Galuzzi in some resources). The family was devoutly Catholic and well-loved by their community of Bologna, Italy. After Imelda was born, her mother had a dream and was convinced there was a message in it about her daughter. The dream was set in Bologna where she saw St. Dominic walking through the streets toward her; she noticed that he had a light radiating above his forehead like a star and just before he went into the Dominican convent, he raised his hand in a fatherly blessing toward her. It was in the year 1220 when Dominic de Guzman held the first General Chapter of his newly formed Order — the Order that Imelda would later enter at a tender age. At age five, while she helped feed the sick and poor of their city, Imelda came to realize that everyone was a tabernacle where God resided. It was during this time that she began to desire Jesus more fully in Holy Communion, but could not receive since the Catholic Church had the age of reason set at 14 years of age. Also during this time, Imelda took St. Agnes and St. Tarsicius as heavenly friends whom she talked and prayed to often to help her love God more fully. Imelda entered the Dominican Order of Sisters in Bologna, Italy at age nine. She continued to serve the Lord obediently with the other sisters in the convent, always on time and willing to complete her chores. At age eleven, after years of prayer and desire for Holy Communion, a miracle occurred during the Mass of the Ascension. A consecrated host left the altar and hovered over Imelda as she prayed in disappointment at not being permitted to receive communion once again. At this sight, one of the sisters ran to get the priest and after he witnessed this miracle, saw it as a sign for Imelda to finally receive Holy Communion. 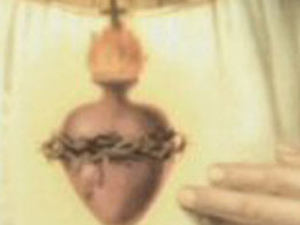 As soon as Imelda received Jesus in the Eucharist, she went into joyous ecstasy. Those with her decided to allow the young sister some time to be alone in her thanksgiving prayers. Later, one of the sisters being concerned for her, went back to check on Imelda only to find the young girl dead. Imelda Lambertini, at age eleven, died of ecstasy just moments after receiving Jesus; she was at peace; her mission in this life was completed. The story of this blessed is an interesting one. Still, for a young child, learning about Imelda’s deep desire to receive Holy Communion might cause some fear, as this is the age that many children learn the realities of death. To have this patroness’ sole purpose in life as the example of true desire for Jesus in the Eucharist is beautiful, but her story ends suddenly and at such a tender age. It should be emphasized, though that Imelda died peacefully, joyfully, and with thanksgiving, she suffered no fear only sheer ecstasy. Imelda’s life, for the young Communicant, can illustrate the beginning of life in union with Jesus through the Eucharist — filled with an abundance of His grace and love. Note: Imelda Lambertini is a blessed due to the miracle of her body found incorrupt. Her incorruptible body is in Bologna, Italy, at the Church of San Sigismondo and she was beatified by Pope Leo XII on December 20, 1826.